Point-of-purchase display components require rugged construction in combination with an attractive appearance. 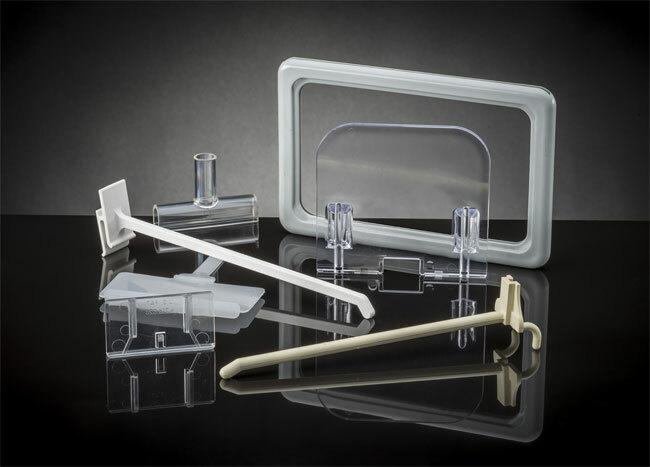 At The Rodon Group, we injection molded a range of products, including items such as pegboard hooks, shelf dividers, and product stops for one of the leading companies in the point-of-purchase display industry. This project highlights our ability to provide value-added services in conjunction with close tolerance injection molding that equates to cost savings over the entire product lifecycle. Working with the customer supplied prints, we first focused our attention on mold design. Our goal, as always, was to construct molds that would lead to volume high quality while minimizing production costs. By paying detailed attention to aspects such as cavity dimensions, gate location, venting, cooling systems, and more, we achieved optimal cycle times while upholding tolerances as close as ± 0.005” across varying complexities in part geometry. One critical feature of these parts was a fine quality surface, so we leveraged the capability of our EDM equipment. This allowed us to create a very fine finish on the mold cavities to add clarity and quality to the surface of the finished part with no extra processing required. Production involved the use of various commodity and engineering grade resins in shot sizes from less that one gram all the way up to 35 grams. With part sizes measuring from 5/8” square up to 3.5” in length x 19” in width, we used a variety of injection molding presses in the 46 to 233-ton range. Machine vision inspection right at the press, combined with a robust set of test and measurement processes, ensured we satisfied all of the quality requirements. 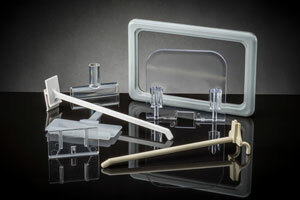 The Rodon Group was able to demonstrate that done right, a high-quality mold and plastic injection experience can result in better quality at a better price. To learn more about this project, or the processes used to manufacture it, see the table below or contact The Rodon Group directly. Overall Part Dimensions 5/8" square to 3 ½" x 19"